The course is designed for teachers, lecturers and tutors teaching, encouraging and supporting young entrepreneurs in the field of Creative Industries. For teachers and tutors the course will look at the importance of developing individuals innovation and enterprise skills, finding new ways to integrate high quality entrepreneurship education into creative services and structures by training aspiring creative entrepreneurs. For those interested in the Creative industries, the course will help them gain a better understanding of the actual industry, how to develop their entrepreneurial skills and how highly employers value innovative individuals. The goal of the course is to empower individuals to become entrepreneurs and high valued employees. The materials are designed for various uses. The course can be delivered as a complete curriculum or parts of it might be integrated to supplement other courses. All materials are provided as open source and each section of this course offers a variety of additional online materials such as case studies and activities about the topic. Teachers and tutors can also use the course on their own for professional development. Information about how we suggest the materials can be used are provided at the beginning of each trainers guide for each module. The course can be used in a classroom environment as well as a self-contained distance learning course. A Learner’s Workbook – this outlines the aims, learning outcomes and usage of each module. Trainer’s Guide- such materials can add value and compliment both the learner’s workbook and the presentations. You can download all seven modules as a zip file. 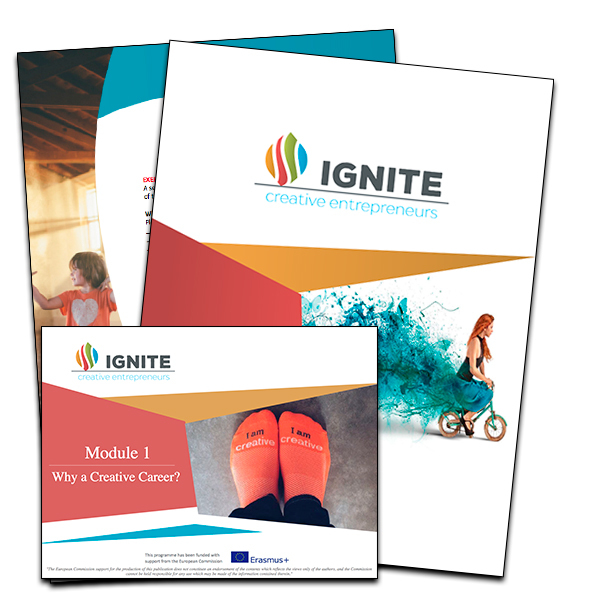 The Creative Communities Igniting Change classroom course is designed as a complete curriculum, each module can be used as a stand-alone session. Therefore, each module starts with a basic introduction about the topic which can be skipped if you use more than one module or the whole course.